When I re-launched LittleBizzy, a managed WordPress hosting company, in early 2015, my business took off like never before. It was the direct result of narrowing my focus, emphasizing quality above all else, and making sure that customer service was fast and actually solved problems. 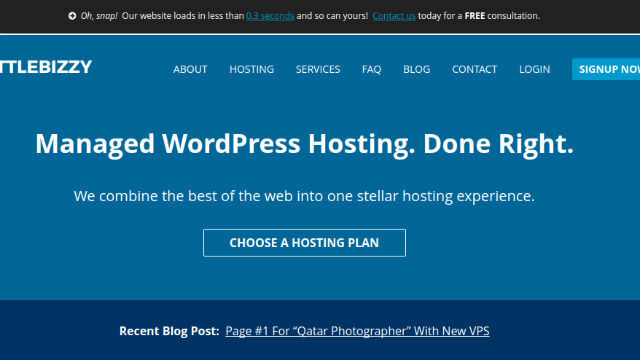 While I’m not particularly “good” at business nor do I see myself as some sort of entrepreneurial figure, I’ve been blessed with success in the world of WordPress hosting, and wanted to share some of my perspective. Building an “online” business is ALWAYS tough. However, growing a business on the web is often a challenge for different reasons than many people might think; after all, the only difference between an ONLINE business and an OFFLINE business is sometimes just that: the internet itself. Sure, there are typical issues like cash flow, scaling, finding customers, hiring staff, and so forth, but one of the most challenging things is this: REPUTATION. According to a widely-circulated 2013 report by Dimensional Research, customers who feel they’ve had a negative experience with a brand are 50% more likely to tell other people about it than if they’ve had a positive experience. Not only that, but these “angry” customers are also 52% more like to post that “negative” experience somewhere on the internet, such as Yelp, BBB, Google, past clients, or otherwise. Now, I’ve always kinda sucked at math, but if you factor in that a brand is already an online-only business, and that, by nature, all of their customers must be web-savvy in order to become customers or initially seek out the business in the first place (i.e. LittleBizzy), I’m pretty sure the above 52% figure becomes something more like 82% (disclaimer: not a scientific conclusion whatsoever). That is, whether or not your online company’s “quality” is good or bad, the chance of certain angry, jealous, or otherwise entitled people trying to hurt your image on the web is pretty strong. This is precisely why online businesses have such HUGE risk when it comes to reputation. And when 90% of consumers say they are influenced by online reviews when making their decisions, well… boy oh boy, the odds are truly stacked against you. Unlike Wally Amos, however, who is quoted above, I’m usually not described as being “warm” and “loving.” While those who know me, even many customers, often describe me as being compassionate or extremely attentive to their needs, I can often come across as overly blunt, direct, or “unfiltered”, perhaps due to my background in analytical research, and my affinity for political and philosophical discussions… (oops?). In case you haven’t noticed, this entire article is carefully crafted to rank high for search terms such as “LittleBizzy” or “Little Bizzy” or maybe even “LittleBizzy reviews” or “Little Bizzy review” type searches on Google. GOAL #3: Lastly, this post serves to prove my expertise. This is a perfect example of turning a weakness into a strength, because while online businesses are more susceptible to reputation problems, they are also more CAPABLE of defending themselves with facts, figures, and online case studies (unlike the local pizza shop). Because CollegeTimes is hosted on the LittleBizzy cloud, and to demonstrate our phenomenal infrastructure and SEO expertise, if this post can rank high on Google for topics related to LittleBizzy it will be a fantastic example of our hosting cloud’s potential. Ultimately, when it comes to the online reputation of your business, don’t hide your weaknesses, but publicly address them. While QUALITY should arguably be your first priority, TRANSPARENCY can serve you wonders in the long run. Maybe you take our word that our infrastructure is top of the market, and that we’ve found a way to seamlessly pair together some of the best technologies on the web into a stellar web hosting service, such as CloudFlare, DigitalOcean, and CodeGuard. But what REALLY sets LittleBizzy apart is how pragmatic it is. The reason we pair together various technologies isn’t just for fun — rather, it’s because after nearly a decade of doing SEO and web development consulting, I finally realized that the biggest issue affecting small to medium business owners (SMBs) was the instability caused by CONFUSION as they cycled through dozens of freelancers screwing up their DNS settings, server configurations, and otherwise. By taking on a more centralized role in these processes, and partnering with the best technology providers on the web, LittleBizzy seeks to be a true source of speed, stability, and security for not just WordPress websites, but for businesses as a whole. Why are there no papers in the box at the Glendale Library?